Robot tender Eric McKee adjusts the settings of a robot welding rod in the body shop at Hyundai's Alabama plant. Before completing his training as a robot technician, he worked on the plant's assembly line installing door hinges. Sonatas and Santa Fes aren't the only things Hyundai Motor Co. is building in Montgomery, Ala. Hyundai's 2-year-old assembly plant also is churning out its own robot technicians. Here are some facts about the training program. It started in March 2004, more than a year before vehicle production began. Trainees are production workers with no previous robotics training. It is limited to the body shop, where about 250 robots perform material handling, stamping and welding in a 100% automated process. More than 100 workers have completed the course. Between 60 and 70 workers are now full-time "robot keepers." MONTGOMERY, Ala. -- Hyundai Motor Co. expected problems finding enough trained technicians to tend its army of robots when it began building a massive assembly plant here five years ago. Plans called for the $1.1 billion factory to be one of the most automated in the world -- no human touches the vehicle until it enters the paint shop -- yet the local work force already was suffering from a dearth of skilled labor. So Hyundai did something it had never done before: It trained its own robotics experts. 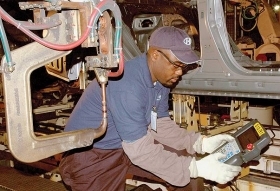 In a homegrown program developed for the Alabama plant, Hyundai plucks production workers from its assembly line and trains them to maintain, repair and even program robots used to make Sonata sedans and Santa Fe crossovers. "When you talk about robots and robot technicians, they are not prevalent throughout many industries, so there's not a good source to pull from," says Robert Katzenbach, senior manager of Hyundai Motor Manufacturing Alabama LLC's weld department from 2003 to 2006. "We looked at our own team members, and what we saw was a lot of bright, motivated people who wanted to contribute to our success. We really felt like we could train them." More than 100 production workers have gone through the robotics training course since its inception in March 2004. Of those, between 60 and 70 have been tapped as full-time "robot keepers" charged with programming the more than 250 welding and material handling robots in the plant's body shop, as well as maintaining weld and sealer schedules and overseeing weld quality. It's a big job. Now running at full throttle, the Alabama plant produces 300,000 vehicles a year. Every Sonata has 6,086 weld points and every Santa Fe has 7,316 weld points. Most trainees have no technical background. Among the program's graduates are a former Wal-Mart employee, a butcher for a Winn-Dixie supermarket and a supervisor at a catfish processing plant. Toby Chance was a machine operator for a local company that makes cotton gins before he joined Hyundai as a production worker in January 2004. A member of the original graduating class, he helped develop the program and now trains others in addition to his salaried position as a weld specialist. "When we started, we really had no knowledge at all of robots. We were given a manual and then just told, 'Learn them,' " Chance says. The trainees had some help. Chance was one of two original trainees chosen to attend 80 hours of training at Fanuc Robotics America Inc.'s headquarters in Rochester Hills, Mich.
Fanuc, which supplies the Alabama plant's robots, also provided in-depth materials used to train employees on the factory floor. With a basic understanding in place, the workers had an ideal training ground to test their new knowledge, says Harry White, the plant's weld process engineering manager. All of the robots had to be installed in the new plant -- and fast. "We knew that the manpower that Fanuc would provide just wouldn't be enough for us to meet all our timelines and our deadlines, so we had to engage our work force and get them up to speed very quickly," White says. The program, which for now is contained to the plant's body shop, is evolving. Last summer, Hyundai benchmarked the skill levels of the program's participants and divided them into three categories. Those at the lowest level entered a 40-hour training course taught once a week by trainees at the highest level. In addition to this internal cross-training, Hyundai has selected a few trainees and dedicated them to studying weld times and quality. "What we see ourselves doing is rotating people in and out of that level so that in five or six years we are a shop of experts," White says. If Hyundai succeeds, it will have an asset coveted in the growing Southern auto industry. No hard data on the shortage of robot technicians in the region exists, but stories of automakers and suppliers pillaging skilled labor from their neighbors abound. Alabama Industrial Development Training, the agency charged with recruiting and training skilled workers for industries in the state, estimates that 90 percent of its manufacturing projects involve some robotics. Automakers are addressing the shortage in different ways. While many do some degree of in-house training, most hire robot technicians who already have a high skill level and have had training. Such is the case with Mercedes-Benz U.S. International Inc. When the Vance, Ala., assembly plant expanded in 2005, the number of robots jumped from about 80 to more than 800. The increased automation prompted Mercedes to double its maintenance work force, which today stands at about 200 team members, says spokeswoman Felyicia Jerald. Honda of America Manufacturing Inc. trains robot technicians at its Marysville, Ohio, plant. But because Honda expects a wave of retirements in the next few years, it has begun partnering with Ohio technical colleges to prepare the next generation of technicians, spokesman David Iida says. While the shortage of skilled labor, particularly robot technicians, in the Southern auto industry hasn't escaped Hyundai managers, the company isn't concerned that it is training workers only to have them scooped up by competitors offering higher wages. Graduates of the robotics training course are on the same pay scale as production workers at the Alabama plant. Says White: "By training our own people, our people are developing the processes. They become experts in the process. They own the process. With that ownership, there's a lot of pride in that. There's a lot of loyalty."